These days, an increasing number of companies decide to introduce uniforms for their employees. These companies mostly belong to the hospitality industries and manufacturing, but you will find examples of uniforms in many other businesses. Not many good business owners will disagree with the fact that a good uniform is the best way to protect employees from dirt, grease or other impurities. Uniforms are also used to present a professional and dignified image to clients. Well-maintained uniforms help keep morale up, improve the way workers perceive themselves. This article will attempt to answer the question of what the real appeal of uniforms is, how they can be beneficial for your business as well as what your employees may think about them. With a managed industrial clothing rental service such as the one offered by Alsco, the industry leader in uniform rentals, the entire business with uniforms is made much easier and more practical. Why Are Some Workers Against Workwear? Despite these advantages, employees often resist the idea of uniforms. However, Alsco can help you overcome their resistance through better design and features. If not designed properly, uniforms may hamper with their work. Uniforms with long loose sleeves that keep dipping into food are no-good for waiters. Alsco has many form-fitting, careful thought of uniforms for different jobs designed by experts to help promote efficiency at work. Some employees may consider uniforms to hinder their ability to express themselves through their clothes. This is why it’s important to pick a supplier with a wide range of modern uniform styles. You can’t please everyone, but picking a fashionable uniform will go a long way in making most of your employees happy to wear it. Many business owners consider it a fact that uniforms present a continuous expense. After all, they need to be clean and look presentable all the time, and this costs money. While this may be true in some scenarios, it is certainly possible to avoid any unnecessary costs by considering a managed rental service. Companies such as Alsco offer great deals – you pay for uniforms once and you don’t have to worry about expenses ever again! Alsco takes care your uniforms are always kept in perfect shape. What Are The Real Benefits Of Workwear? Industrial apparel serves many useful purposes – for both the businesses and the employees. In industries such as the construction or mining, workwear such as hi-vis clothing and hard caps can ensure that the employees are visible and protected. Employees feel safer and are able to work more productively without having to constantly be concerned about their safety. The clothing for certain jobs is designed keeping in mind the specific requirements of these jobs. Chef’s jackets are a perfect example of this. They have pockets in specific areas, are full sleeved to offer protection and made from materials which allow for food stains to be cleaned easily. Uniforms with logos of the company are great branding and marketing tools. Every time an employee of yours steps out in public, he is a walking billboard. Uniforms can have everything from the company name, logo and the corporate slogan on them. They will almost always have at least one of the above. Uniforms enhance the image of the organisation in the eyes of its customers and suppliers. A sense of trust and recognition is built when they see your employees in uniforms. This is particularly important for industries like pest control, household appliances, etc. where employees visit homes of people for product delivery, installation and servicing. A uniform also makes it easier for the customers distinguish and identify the employees of the establishment from its clients. This is very useful in hotels, restaurant, busy airports, bus terminals, etc. A customer knows exactly who he needs to approach for any query or assistance without having to wonder if the other person isn’t another customer like them. A uniformed team conveys a message of professionalism, cleanliness, reliability and organisation to its customers. This is the reason why many professions such as nurses, air hostesses, and restaurant and hotel staff wear smart looking uniforms. Uniforms help to foster a sense of pride in their jobs and a sense of belonging to an organisation. A common identity helps work towards common goals. Sports teams, in particular, are associated with their team uniforms and colours which are a symbol of their pride. The same philosophy applies at workplaces too. The common workwear helps iron out intra-team differences since no one is wearing different clothes which reflect the different ethnicities, race or status of the team members. Teams bond better. Starbucks employees across the world can be recognised by their trademark uniform, irrespective of which country you go to. This helps the organisation to deliver a message of consistency in service quality across the globe. When it comes to introducing uniforms to your workplace, the first step – making a decision – is certainly the hardest one. After that, if you delegate responsibilities for uniform maintenance to a rental service professionals such as Alsco, you will be able to reap only benefits of your decision. 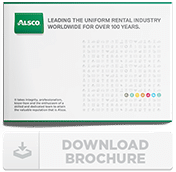 If you are still wondering about the best course of action, or have some questions about how the rental service works, feel free to contact Alsco and hear what their friendly representatives have to say. Get your own customised quote today.